With the return of as many as 18 letterwinners, the 2011 Flying Dutchmen will be seeking to build on a conference championship season. A year ago coach Steven Smith's Flying Dutchmen had an amazing finish to the season to gain a co-championship of the Michigan Intercollegiate Athletic Association (MIAA) with rival Calvin and a berth in the NCAA Division III championships. The 2010 Flying Dutchmen went undefeated in the second half of the conference season to gain the league co-championship and thanks to a pair of victories over rival Calvin gained the MIAA's automatic berth in the NCAA Division III championships. The team ended 13-6-2 overall. Over the past decade the Flying Dutchmen have won nearly 80% of their matches (157-46-17) with five conference championships and five appearances in the NCAA playoffs. Coach Smith begins his 22nd season at the helm of the men's soccer program. He ranks among the inningest NCAA Division III coaches with a career record of 291-96-33. His mark against MIAA opponents is 200-54-19. The pre-season roster of returning players includes seven sophomores, five juniors and six seniors. The co-captains of the team will be seniors Shaun Groetsema of Augusta (Galesburg-Augusta HS), Logan Neil of Holland (West Ottawa HS), Jeffrey Stusick of Stevensville (Lakeshore HS), and David Whitaker of Vicksburg (Vicksburg HS). Each of the co-captains received All-MIAA honors in 2010. 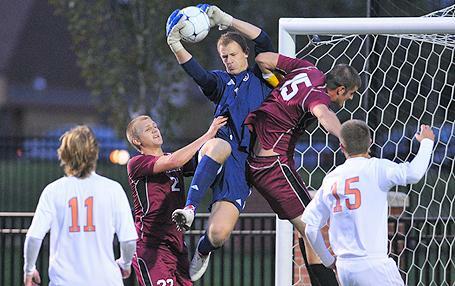 A goalkeeper, Neil was voted the MIAA's most valuable player. He was joined on the All-MIAA first team by Groetsema and Whitaker while Stusick received second team recognition. Groetsema and Neil also received All-Region honors. Neil, who is also a member of the Hope basketball team, has ranked among the nation's top Division III goalkeepers. Over 37 career starts he has allowed just 24 goals. Other returning letterwinners include senior Andrew Abe of Naperville, Ill. (Naperville North HS), senior Paul Austin of Grandville (Grandville HS), sophomore Mickey Biebelhausen of Rochester (Rochester Adams HS), junior Maxwell DeBoef of Plainwell (Plainwell HS), junior Luke Dishnow of Saline (Saline HS), junior Jeff Ekdom of Holland (Holland Christian HS), sophomore Nicholas Heyboer of Grand Haven (Grand Haven HS), junior Conor Hughes of Plainfield, Ill. (Plainfield North HS), sophomore Ben Lemmen of Holland (Holland Christian HS), junior Jason Muller of Petoskey (Petoskey HS), sophomore Grant Neil of Holland (West Ottawa HS), sophomore Matthew VanZytveld of Grand Haven (Grand Haven HS), sophomore Brayden West of West Olive (West Ottawa HS), and sophomore Cole Whitaker of Vicksburg (Vicksburg HS). The Flying Dutchmen will play nine home games, mostly under the lights of beautiful Van Andel Stadium which will see its third season of use. The Flying Dutchmen approach the season faced with a schedule identical to the 2010 campaign. The 102nd year of Hope football will find coach Dean Kreps' Flying Dutchmen trying to shake off the affects of three consecutive 3-7 campaigns. The 2011 Flying Dutch will be seeking to pick up where they left off a year ago when they competed in the NCAA Division III championships.